Looking for the best shoes for Achilles tendonitis? Whether you’ve been diagnosed with this painful ailment because you are a fitness fan or you’ve just overdone it courtesy of your active lifestyle, the right pair of shoes contributes mightily to recovery from this painful condition, so don’t shop before reading our recommendations. This condition can happen to anyone—young, old, active and inactive—as a result of injuring the springy band of tissue located above the heel at the back of your ankle. Because the Achilles is the largest tendon in the human body–stretching from calf muscle to heel bone–the extent of an injury to this part of your anatomy can range from a mild annoyance to a debilitating condition that causes mobility difficulty. How impactful is the Achilles tendon? Scientific researchers have discovered that the energy stores in the Achilles tendon alone can, if exercised properly, increase an athlete’s speed by 80-percent, so for runners, this injury can dramatically interrupt a training program. Even if you’re not an athlete, an injury in this area can affect everyday motion, so if you sustain this injury everything from your motility to your gait can suffer. If the word Achilles sounds familiar but you can’t quite recall why, your history teacher failed to do her job! Achilles was the son of the goddess Thetis who dreamed he would die if she didn’t take action. Taking him to the River Styx, she dipped his entire body into the river to avail him of the water’s healing properties, but to make sure he didn’t drown, she held on to his heel. When writing his book on anatomy, Flemish researcher Philip Verheyen coined the name Achilles tendon based on that Greek myth because the god’s permanent vulnerability came down to that exposed heel. What causes the Achilles tendon to be injured? When a tendon vibrates as a result of movement, calf muscles are stimulated, the brain is notified and the central nervous system acts to regulate bipedal activity. Any mobile engagement requiring the ankle to pivot or change pace has the potential to injure the Achilles tendon. Overdoing activity and ignoring pain in the ankle/heel area. Adopting a physical activity quickly rather than gradually. Conditions like flat feet/fallen arches. Glucocorticoid and Fluoroquinolone medications can trigger tendonitis. Doctors typically use an MRI or ultrasound machine to confirm a diagnosis. In extreme cases, the tendon may be probed with an instrument to assess damage. As a rule, non-steroidal anti-inflammatory drugs are prescribed to manage pain and suffering. Further, overexertion that triggers tendonitis can be compounded by advancing age, gout and arthritis, which–left unattended–can lead to calf muscle tears requiring surgery. As part of a sufferer’s rehabilitation, physicians regularly advise men and women to buy shoes that hasten the recovery process. If the shoe fits, please wear it! Add any of these six top-of-the-line branded shoes to your arsenal of weapons used against tendon issues and recommend your favorite pick to others “walking in your shoes” if they ask about the best shoes for Achilles tendonitis. Fans of the ASICS brand know the story behind its unusual name: the acronym was picked by founder Kihachiro Onitsuka because it translates as “A sound mind in a sound body” in Japanese. Inspired by post-WWII kids wandering Japan streets barefoot, Onitsuka’s goal became creating shoes so the children of Japan would always perform their best. The founder’s vision proved fortuitous as the ASICS brand grew successful and these days, adults benefit from the brand’s presence on the athletic shoe scene as well. The men’s GEL Nimbus 17 shoe isn’t the first iteration of this style, by the way, and it has gained a worldwide reputation for being the best walking shoes for Achilles tendonitis, too. Men who like a little flair in their step are drawn to this shoe with its flash yellow accents, rubber sole, reflective upper and glow-in-the-dark GEL cushioning. The shoe’s shaft is kind to the feet of Achilles tendonitis sufferers thanks to the FluidFit upper technology, shaft design and an eyelet lacing system that doesn’t detract from the appearance of this attractive shoe. Because it was designed with all types of runners in mind, everything about the engineering and especially the cushioning surrounds feet comfortably and cradles the feet of those suffering from injuries to the foot. If you suffer from under-pronation issues, you might think the Nimbus 17 was designed just for you. You’re probably right. Impressive moisture management so feet breathe comfortably. ASICS Gel-cushioning reduces shock during impact and at toe-off. Cushioning offers tender areas of the foot noticeable bounce-back stress relief. The Nimbus 17 could be a problematic fit for men with wide feet. Toe box tends to be slightly small. Construction issues are reported by men who are obese, so keep this in mind. The affordable Surin Cross-trainer could be your answer to Achilles tendonitis relief if you like a conservative-looking men’s shoe in black, silver and gray and prefer a pair of athletic shoes made of leather rather than a synthetic. These foot-soothing trainers feature toe, heel, vamp and side perforations, so wearers feet stay dry within a sweat-free environment so Achilles tendon issues aren’t compounded. 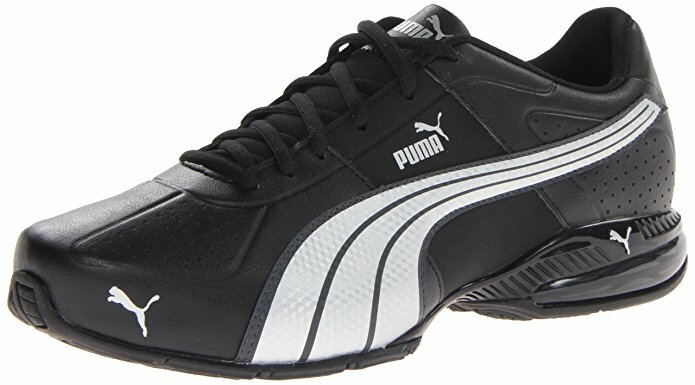 This Puma athletic shoe offers an extra measure of stability courtesy of the TPU shank and there’s additional cushioning at the heel where the potential for discomfort is likely for those with compromised tendons. Outsole traction grips the ground beneath your feet so the potential for future ankle twists that can lead to re-injuring the area is diminished. There are deals to be had; this shoe has been around for awhile. Enjoy the confidence of knowing that your foot is protected against re-injury. Easy to break-in, say frequent buyers, and wearers experience immediate comfort. Wear them everywhere; clean-up is fast even when encountering mud and grime. While the shoe cleans up nicely, mesh embellishments may stain. If you require a lightweight running shoe, be advised that this shoe has a heavy sole. Even Puma fans warn purchasers to buy a half-size larger for a better fit. 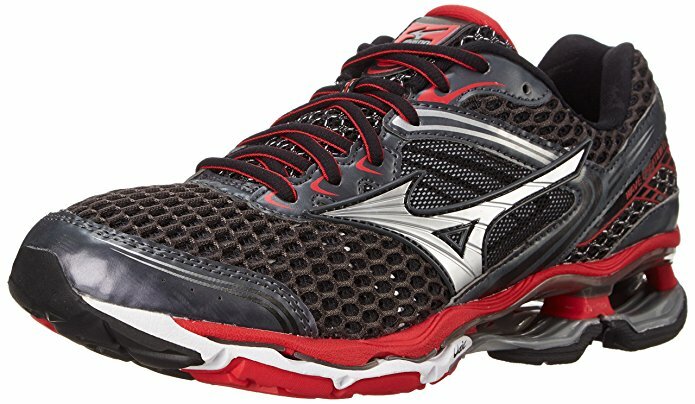 If a long-standing brand with a commitment to the environment for over 100 years appeals to your sensibilities, this Mizuno Wave Creation 17 should top your list. In addition to extra support in the area that’s of the greatest concern to those suffering Achilles tendonitis, the synthetic materials used to craft these shoes are 100-percent vegan so you can satisfy your desire to avoid wearing leather. Light and fast for those getting back on their feet following injury that may have derailed their athletic endeavors, the Mizuno Wave delivers “a fluid, natural ride” courtesy of design innovations and the high-mileage trainer features an open-cell mesh overlay that adds heft and breathability to a supportive midfoot wrap that can take the pressure off that sensitive Achilles tendon. Brand fans call the 17 better than 15 and 16 after sticking with the Wave since the style hit the market. Pressure relief at the heel qualifies these for inclusion on the best running shoes for Achilles tendonitis list. For those with flat feet, this shoe was designed for you—-with or without an orthotic insert. Don’t buy ’til you try; this shoe can run a half size smaller and tends to be narrow. Elasticity in the laces could lead to trips if the shoes loosen in mid-run; think of replacing them. Reports of arch support plastic breakage could land you in a world of buyer’s remorse. If you’re looking for a lively mix of Caribbean color, this pair of ASICS athletic shoes won’t eat up your entire shoe budget and it comes in widths that treat your Achilles tendon to lots of TLC. The ASICS Gel-Contend 3 features a rubber sole that cushions footfalls to lower impact on the most sensitive area of your foot. The shoe shaft measures 2.55-inches from the arch and this textile/synthetic shoe mix makes clean-up easy because you can toss these shoes into your washing machine if you like. 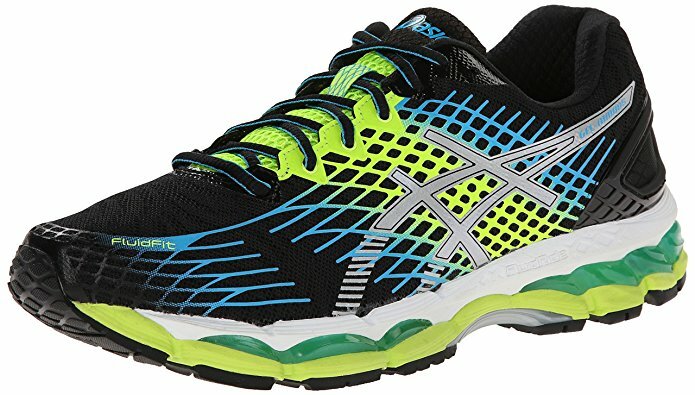 Designed with the female Achilles sufferer in mind, the GEL-Contend feature is incorporated into other ASICS athletic shoes because it offers wearers exceptional cushioning and fit, whether you’re just getting into running or you’ve already been there for a while and were sidelined due to an Achilles tendon flare-up. If you like the idea of a shoe manufactured by a company in the business for over 100 years and haven’t tried an ASICS running shoe in the past, this may be the time you say yes. If you’re all about style, color and comfort on a budget, treat your feet to this popular shoe. Highly recommended by women who stand all day and those who have weight issues. Soft gel soles and good arch support delight those with plantar fasciitis and Achilles tendon ailments, which is why podiatrists often recommend this specific shoe. You’re advised to go half a size larger because the shoe is narrow and pampering your tendon is wise. Complaints about arch support issues and fit have been registered with ASICS. If you suffer from over-pronation in addition to tendon issues, these may not be your best bet. The first thing you notice about this pair of best walking shoes for Achilles tendonitis sufferers is the beefy sole. Put them on and comfort takes over. Depending upon where you shop, the second thing you likely notice is the price differential between one retailer and another. A study in black and white design, these Shape-ups are built of sturdy leather and fabricated to exacting standards. Getting in and out? A breeze. The boot opening is 10-inches in circumference. Since the shaft measures 7-inches from the arch, the heal adds 1-inch of cushioning and that platform provides an additional layer of separation between you and the ground, you might think designers ignored ventilation in favor of beneath-the-foot protection. Not so. The leather and mesh outer features ventilating properties that keep feet cool, and the tongue and collar have extra padding. 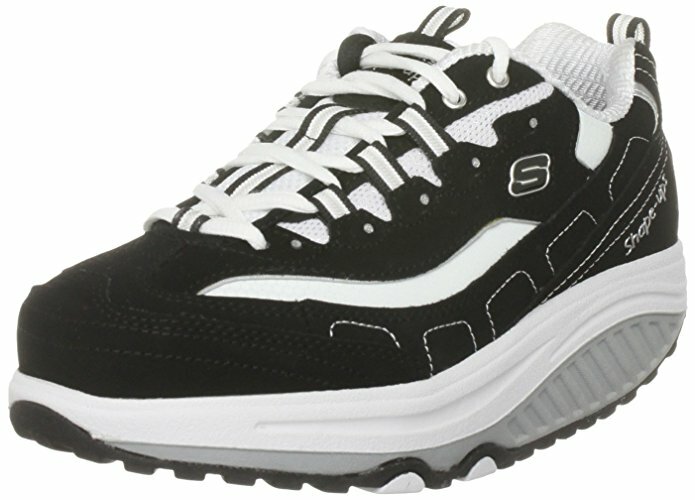 The Skechers brand has been a player in athletic footwear for many years, so if you like this brand, try them on. Cute, fashion-forward and designed to give calves and upper legs a workout. Comes with a video that “teaches” new wearers how to get the best workout without running. Recommended for woman after podiatric surgery. “Impact-reduction is mind blowing,” said one skeptic fresh out of surgery. Heel slippage has been reported by shoppers; pay attention to size or you could exacerbate your tendon issues. It takes getting used to the heel angle which can add, not detract, from discomfort at the ankle. Shoes are pricey and come with no warranty so if you’re one of the rare women experiencing sole detachment, you’ll have no recourse. When it comes to trendy styling, this black training shoe with peach and yellow trim has no equal, so fashionistas everywhere will wear these PUMAs with pride. They’re not always available because they sell out fast, but they’re worth the wait if your size happens to be momentarily out of stock. Fabricated of synthetic materials, the faux-leather design embellishments and breathable mesh upper ventilate and cushion feet sensitive to heel-area issues, which is why the high-rebound EcoOrthoLite sock liner has become one of the biggest reasons women are willing to wait for this shoe to be replenished on shop and Internet site shelves. The tongue and collar are padded to the max; the midsole and heel is lavished with more cushioning material and holding all of this comfort together is the Riaze’s EverTrack high-abrasion outsole that never met a ground condition it couldn’t mediate. For women suffering from tendonitis issues, this cross-trainer has a bounty of benefits and features, but you’ll have to be patient if it’s at the top of your shopping list because this shoe is hard to find. The padding is so thick, shoppers with flat feet rave about comfort and security. Versatile and flattering, they transition from sports to casual wear effortlessly. Virtually no break-in period; get your hands on these and you’re ready for action. The most obvious drawback is availability; these are very hard to find and once they’re gone, that’s it. Experienced runners eschew the term “cross trainers,” saying these are too tight and narrow to qualify. Not always appropriate for wear by high-performance runners who seek marathon-worthy stability and speed. For men, we highly recommend the ASICS Men’s GEL Nimbus 17 Running Shoe because it’s an affordable option for men who appreciate the quality, styling and benefits of wearing a shoe the has brought relief to so many Achilles tendonitis sufferers. The brand is solid, GEL-cushioning unparalleled and it’s readily available in myriad sizes from online and retail resources around the world. 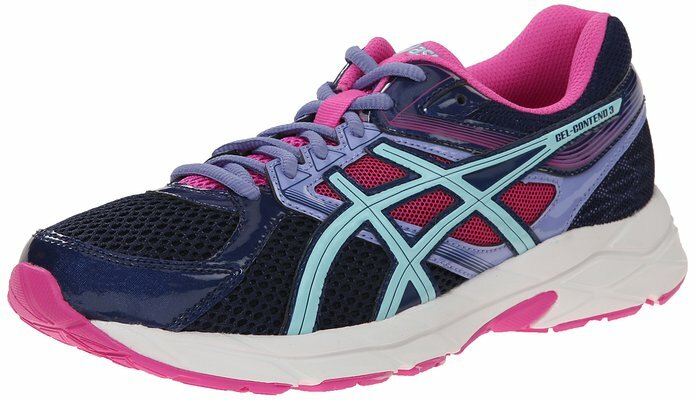 For women, our top pick would have been the PUMA Women’s Cell Riaze Cross-Training Shoe were availability not problematic, therefore, we’re sticking with the ASICS brand and suggesting that the best women’s shoes for Achilles tendonitis sufferers is the ASICS Women’s GEL-Contend 3 Running Shoe–for many of the same reasons we like the men’s ASICS. Those in need of the best walking shoes for Achilles tendonitis can’t go wrong with any of the shoes on our list, but in our estimation, the men’s and women’s ASICS styles come out on top. Extremely Informative Most Appreciated of the Info Very Helpful Now I know what to buy and I understand the achilles tendonitis thank you so very very very much.